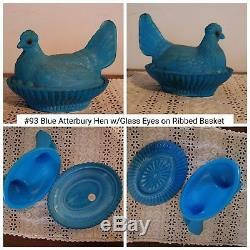 Blue Atterbury Hen w/Glass Eyes on Ribbed Basket Antique/Vintage Milk Glass Covered Dish. The item "Blue Atterbury Hen withGlass Eyes on Ribbed Basket Antique/Vintage Milk Glass Dish" is in sale since Wednesday, August 22, 2018. This item is in the category "Pottery & Glass\Glass\Glassware\Opaque\Milk-White". The seller is "antiquehummingbird" and is located in Brunswick, Georgia. This item can be shipped to United States.